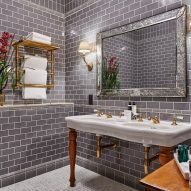 A former bank in the City of London designed in 1924 by British architect Edwin "Ned" Lutyens has been converted into a lavish hotel, club and dining venue by Soho House and named "The Ned" in his honour. Featuring bars in the former bank vaults and multiple restaurants in the vast ground floor banking hall, the development takes its name from the architect's nickname. 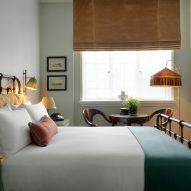 The Ned is the latest project by Soho House, which also transformed a derelict farm in the English countryside into a luxury hotel and helped to pioneer the resurgence in members' clubs when it invited Tom Dixon to create the interiors for its Shoreditch House venue. The company's founder Nick Jones worked alongside Andrew Zobler of New York's Sydell Group to oversee the renovation of the Midland Bank's former headquarters, which is situated close to the Bank of England and opposite James Stirling's postmodern icon No 1 Poultry. The Portland stone building was designed by Lutyens in 1924 and completed in 1939 as the head offices for the bank, which was once the largest in the world but which disappeared as a brand after being taken over by HSBC in 1992. 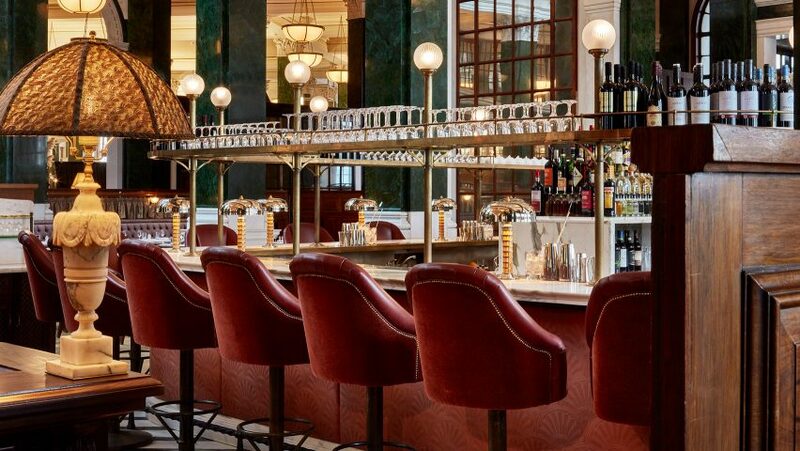 Prior to its purchase by a group including Soho House chairman and investor Ron Burkle, the Grade I-listed structure at No 27 Poultry had been vacant for over a decade. 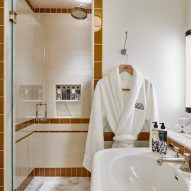 In its new incarnation, The Ned contains nine restaurants, 252 bedrooms, a range of men's and women's grooming services, and a social and fitness club incorporating a rooftop pool, gym, spa, hammam and late-night lounge bar. The design team's intention was to revive the building in a way that retains the grandeur of the original spaces, including the 3,000-square-metre former banking hall. This space at the centre of the building now contains eight restaurants serving a range of global cuisines in areas separated by 92 African verdite columns and rows of walnut banking counters. 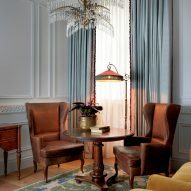 Throughout the bedrooms, period features including walnut panelling and chandeliers were restored, with furniture and fabrics designed to complement these elements. 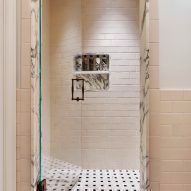 "Brass and mahogany furniture, chandeliers and richly patterned furnishings decorate The Ned's 252 bedrooms," said the developers. 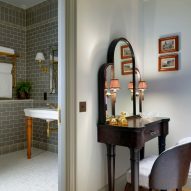 "Each room channels 1920s and 1930s design, with vintage pieces, hand-knotted rugs and rainforest showers." The bank's original strongroom now contains a cocktail bar and lounge lined with 3,800 safety deposit boxes. The bar is accessed through a 20-tonne, two-metre-wide circular door, and is described by Jones as "the ultimate lock-in bar". 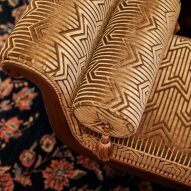 Rooms available to rent for meetings and events include a saloon dominated by an 18th-century chandelier, and a walnut-panelled room featuring a pastoral tapestry that was the largest of its kind ever made in England when it was created in the 1920s. On the building's roof is a heated pool and bar area with views towards the Bank of England, St Paul's Cathedral, Renzo Piano's skyscraper The Shard, OMA's Rothschild Bank headquarters and other London landmarks. Sir Edwin Landseer Lutyens was born in 1869 and died in 1944. He achieved fame for adopting elements from traditional styles of architecture, building numerous country houses, public buildings and war memorials. He also played a key role in the design of New Delhi in India. Last year Dezeen spoke to Soho House founder Nick Jones at Soho Farmhouse – the 100-acre farm in Oxfordshire Soho House converted into a luxury resort – about his approach to design and plans for expansion. 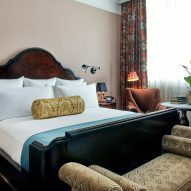 "I think that, above all, it's got to be comfortable," he said, explaining why Soho House properties eschew contemporary design and instead adopt a signature retro look. "When we design a place it has to feel like it has atmosphere with no one in it. I'm constantly reminding our designers that it's not about them." The company, which came in at number 379 on the inaugural Dezeen Hot List, has established a global empire of private members clubs, restaurants, spas and an online homewares store over the last 20 years.